The Asian Development Bank expects to invest approximately $280 million in Fiji in 2019‑2020. This was revealed today after the ADB President Takehiko Nakao and Prime Minister Voreqe Bainimarama met to discuss ways ADB will expand and strengthen its partnership with Fiji. It was also revealed that this money will be used for major planned projects which include a loan to expand sewerage infrastructure in Suva and policy‑based loans to improve the business environment and public sector management. 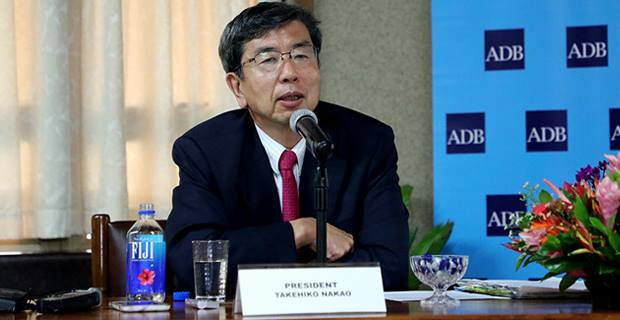 Nakao says that ADB has already started preparation of a Nadi River flood protection project, which is expected to be co-financed with the Japan International Cooperation Agency. Nakao says that ADB will also continue to mobilize co-financing from development partners, such as the European Investment Bank and the World Bank. During his visit to Fiji as ADB President, Nakao visited facilities in Denarau and Natadola which will be the sites of ADB’s 52nd Annual Meeting of the Board of Governors from the 1st to the 5th May, this year. He says that Fiji will be the first Pacific developing member country to host ADB’s Annual Meeting. Nakao says that the meeting is the largest gathering of the Bank and a unique opportunity for ADB Governors, government officials, private sector, development partners and experts to discuss critical issues and challenges facing Asia and the Pacific. The President of ADB says that he is impressed by the beautiful venues and high‑quality facilities selected for the Annual Meeting and this is an excellent opportunity to highlight the strength of the Fijian economy and progress across the wider Pacific region. Meanwhile, the Prime Minister Voreqe Bainimarama says with Fiji’s economy charting record growth and with an educated, talented, and ambitious workforce at their disposal, there is ample room to strengthen longstanding partnership with ADB. Bainimarama says that their priorities for that partnership are clear and they want to attract more investment, further boost climate resilience, and continue to build confidence in the economy by increasing engagement with the private sector. ADB has committed $593 million of assistance to Fiji since it joined the bank in 1970. Ongoing ADB projects include the $100 million Transport Infrastructure Investment Sector Project, the $42 million Fiji Urban Water Supply and Wastewater Management Investment Program, the $15 million Sustained Private Sector‑Led Growth Reform Program, and the $50 million Emergency Assistance for Recovery from Tropical Cyclone Winston.